A southern Indiana man who was adopted as a newborn and spent decades looking for his birth mother is getting the best Christmas present of his life. 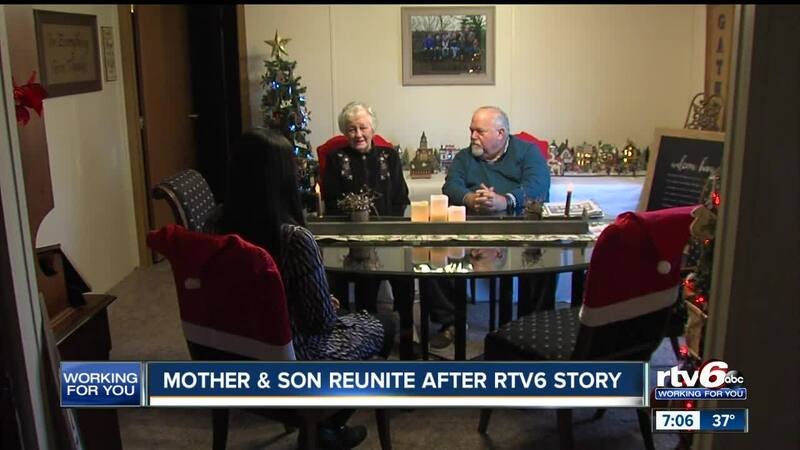 Scripps affiliate RTV6 in Indianapolis first spoke to Nick Schneider back in June, just before a new Indiana law took effect opening more than 50 years of adoption records. Schneider was born at St. Elizabeth Catholic Charities and grew up with his adoptive parents in Tell City, Indiana. "We had a good life," Schneider said. "I was the first one to go to college." He remembers finding out he was adopted when he was 12 years old. “I just always wanted, just had an empty thing there. I needed to know where I came from,” Schneider said. After his adopted mother passed away 30 years ago, he started searching for his biological family. “I was a journalist for a lot of years. I’ve done these in the past. I always thought, ‘I wish it was me being written about,’” Schneider said. Schneider had spent time doing some research on his own and even completed the DNA test from ancestry.com. And when the state announced they would be unsealing over 50 years worth of birth records, he was one of the first people to fill out a request form and share his search with the world. As part of his interview with RTV6 back in June, Schneider shared a photo of his late grandfather – and it was that photo that started the ball rolling. 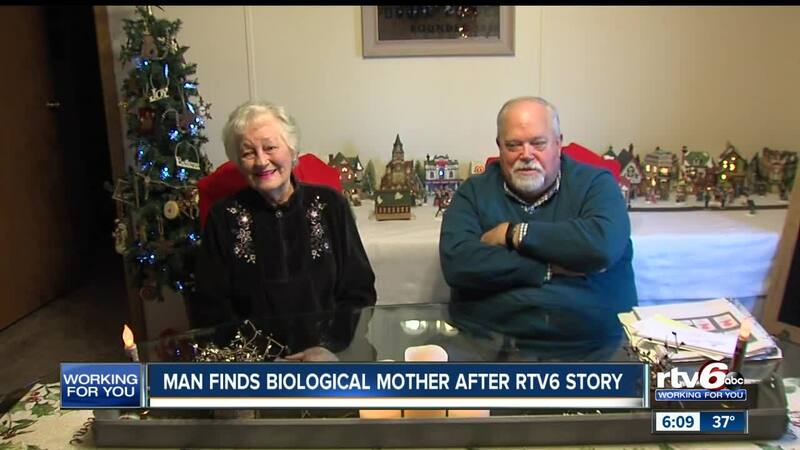 One of Schneider’s biological cousins saw the story on RTV6 and recognized the photo as his grandfather. Days later, he got a phone call from Shirley Williams. “When he answered the phone, I said ‘this is your mother, you found me,’” Williams said. Shirley and Nick met for the very first time back in September. After that meeting, Nick received his birth certificate in the mail after his record was unsealed. That piece of paper he had waited so long to get confirmed that Shirley Williams was his birth mother. Williams was raised in Princeton and she was just 17 years old and a senior in high school when she got pregnant in 1953. “I really didn’t decide to give him up. It was decided for me. In those days, girls didn’t keep their babies,” Williams said. “It would have been a disgrace to my family. She was sent away to a home for unwed mothers where she gave birth to a son. The child was put up for adoption and she was sent home. Williams later went on to get married and had four more children. Williams lives in Seattle now, but she made the trip to Indiana to spend her first Christmas with her first-born child. “Never thought that I would ever get to lay eyes on him. You know, I gave him away when he was a day old. I never thought I would blessed to see him again,” Williams said. And after 30 years of not knowing his true identity, Schneider will spend his first Christmas with his birth mother. Thousands of families are still waiting for those unsealed adoption records and they may have to continue waiting. Since the law changed on July 1, the state has received more than 3,000 requests for records. In early December, Call 6 Investigates reported that the State Department of health said adoptees should expect to wait 20 to 22 weeks for their records requests to be fulfilled – more than two months longer than what was initially anticipated. They say the reason it’s taking so long is that it takes several days to complete each request, due to the very detailed verification process they have to go through. Williams and Schneider hope that by sharing their story will encourage other Hoosiers who are looking for their birth parents to continue to have hope.